Breakfast with Santa and other merry to-dos are on their sleigh-way to San Jose. Breakfast with Santa and other merry to-dos are on their sleigh-way to San Jose. Admire the decorations around the famous mansion beginning on Nov. 16, 2018. HOW LONG... would it take to decorate a mansion for the holidays, a colossal abode that's famous for its many, many, make that super-bunches o' rooms? Well, calculate how long it took you to hang lights around your den, and go from there. Would you need to start decorating this particular mansion in the summertime? Spring? On the first day of the year? Or would you need to start even before the last Christmas was done and through? These are some deep questions to ponder, for sure, but breathe a sigh, for you will not be called upon to festoon the massive Winchester Mystery House, in San Jose, with all sorts of baubles and gewgaws. There are hard-working staffers who handle that holiday-festive job, in impressive fashion, and while many public-facing rooms are decorated, the whole massive manse is, breathe a sigh, not. TO SEE THIS VINTAGE CHEER... on full and fantastical display, and to admire the cheerful holiday finery that the landmark wears each yuletide season, get a ticket to the Winchester beginning on Friday, Nov. 16. That's when the ornaments and lights'll be on display and delighting guests, and the delight will continue for a few weeks to come, right through to Dec. 31, 2018. Also lovely? 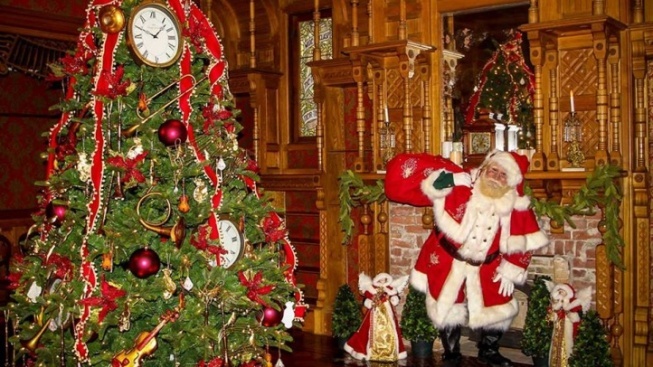 While the decorations around the house's handsome main rooms make for a merry vibe, there are some special events, too, just ahead, including Breakfast with Santa and Gingerbread House Building. FOR MORE DETAILS... on the seasonal look of Sarah Winchester's hauntingly beautiful home, click. Might there be a ghost sighting, too? Well, ghost stories and Christmas were quite popular in the Victoria era, so, as always, keep your spirit-seeking sense keen.